A true German-style Kölsch. Originally brewed in Cologne, this beer is crisp and refreshing, yet has a sweet malty body that is balanced by a complex, citrus hop character. Multiple additions of German Hallertauer hops are used to achieve this delicate flavor. We use a special Kölsch yeast, an ale yeast that ferments at lager temperatures, to yield the slightly fruity, clean flavor of this beer. Fancy Lawnmower Beer is a world class brew yet light enough to be enjoyed by Texans after strenuous activities, like mowing the lawn. Saint Arnold Fancy Lawnmower Beer is best consumed at 35-45° Fahrenheit. Recommended pairings: Blackened fish, salads, and grilled veggies. True to style, this beer is brewed with just pale malted barley and a dash of malted wheat. We import the world's best pils and wheat malts to create the light yet rich malt body. We use a single hop variety in this beer: Hallertauer Hersbrucker. Four separate additions to the brew kettle create the delicate flavor and aroma of this classic hop. We developed this beer because we wanted a slightly delicate beer in our portfolio, and one with a crisper, hoppier character than the Texas Wheat. We settled on Kölsch for the style. When it came to naming the beer, we performed our typical expensive, highly sophisticated consumer research program. We made a sheet of paper with five potential beer names on it: Select, Blonde, Kölsch, Golden and Fancy Lawnmower Beer. We then went around to any parties or bars we were at and handed out these sheets to have people rate their perception of the quality of the beer with each name on a scale of 1 to 5. If we just averaged the totals, Golden would have won. People rated Fancy Lawnmower Beer either a 1 or a 5, but all anyone wanted to talk about, no matter what they rated it, when they handed their questionnaire in was Fancy Lawnmower Beer. This beer has a distinctive floral hop aroma. This, combined with the power of suggestion leads many people to inform us that this beer tastes like grass. No it doesn't, silly. And stop smoking so much of it. Research has also found this beer to be perfect for tailgating at Texans game. Especially on those crisp, fall days at the beginning of the football season in August. In Houston. In a paved parking lot. Daydream is a bright American saison with American hops and Belgian yeast. It has a floral and fruity aroma with quite a bit of citrus and tropical fruit notes. It has a slight breadiness from the malt, a spicy and fruity Belgian yeast character, and a nice citrus hop flavor. Its dry finish invites you in for another sip. None yet, but give it time! Theory of relativity. Gravity. Post-it Notes. All of these have something in common: they were discovered while their originator let their mind wander and dream. Now, we can add our newest year round beer to that list, thanks to the dreaming mind of our head brewer Eddie. Eddie's dream started with the flavor of a beer and led the brewing process. When he took his first sip, he immediately awoke. Eddie knew he had to make the beer of his dream come to life. The result is Daydream. With this beer, we only add hops to the whirlpool. This allows us to get as much hop aroma as possible without extracting too much bitterness. This beer is brewed with a combination of pale 2 row, pils and Munich malted barley along with a small amount of black malt. We import the world's best pils malt to create the light yet rich malt body. We use our traditional Kölsch yeast in this beer, fermented on the cooler side. This beer has been about five years in the making and started as a project to rename Brown Ale. We asked Texas artist Carlos Hernandez, known for his Day of the Dead Rock Star paintings, to do his interpretation of St. Arnold. It morphed into what is now the Santo label. We loved the artwork, but it also made us decide to come up with a new beer to match the artwork. This is backwards from how we normally work. Between many test brews, going down a couple different style paths, building the newery and moving equipment, the process ended up taking several years. We couldn’t be more pleased with the results though. It has become the favorite post-shift beer for our brew crew. What – you don’t have post-shift beers at your place of work? A blonde ale with real blood oranges. A strong citrus aroma comes from blood orange purée added during fermentation and the choice of citrusy hops. The combination of sweet, bitter and slightly tart flavors make it a balanced, light bodied beer. Each batch of Orange Show uses 2,200 lb of real blood orange purée. That translates to about 1/2 lb per gallon. A portion of the proceeds from this beer will be donated to the Orange Show Center for Visionary Art to promote arts education in Houston. The final beer has a light maltiness, a big refreshing bitter and wonderful, delicate hop flavor and aroma. This is the beer we enjoy every year in the Czech Republic when doing our Saaz hop selection. Only, we've added even more hops. It is a beer that can be enjoyed everyday of the year. You will never tire of it. Brewed with a single malt, Pils. Brewed with a single hop, Saaz. Our original Bohemian Pils was released as Icon Red in 2013. 5 O'Clock Pils is a hoppier version of that recipe. A well balanced, full flavored, amber ale. It has a rich, malty body with a pleasant caramel character derived from a specialty Caravienne malt. A complex hop aroma, with a hint of floral and citrus comes from a combination of Cascades and Liberty hops. It has a rich, creamy head with a fine lace. The light fruitiness, characteristic of ales, is derived from a proprietary yeast strain. Saint Arnold Amber Ale is best consumed at 50 - 55° Fahrenheit. Recommended pairings: Hamburger, fried seafood, & hearty soups. We use only malted barley. No other grains or cereals such as corn or rice are used. Our 2-row pale malt comes from the Northern Plains (Minnesota and Wisconsin). Our specialty Caravienne malt is imported from Belgium. We use Pacific Northwest hop varieties. The addition of Cascades early in the brewing process gives the ale bitterness to balance the malt sweetness. More Cascades are added in the middle of the brew to give a pleasant hop flavor. We finish with Liberty hops, a "Noble" variety, which gives a round, soft hop aroma. 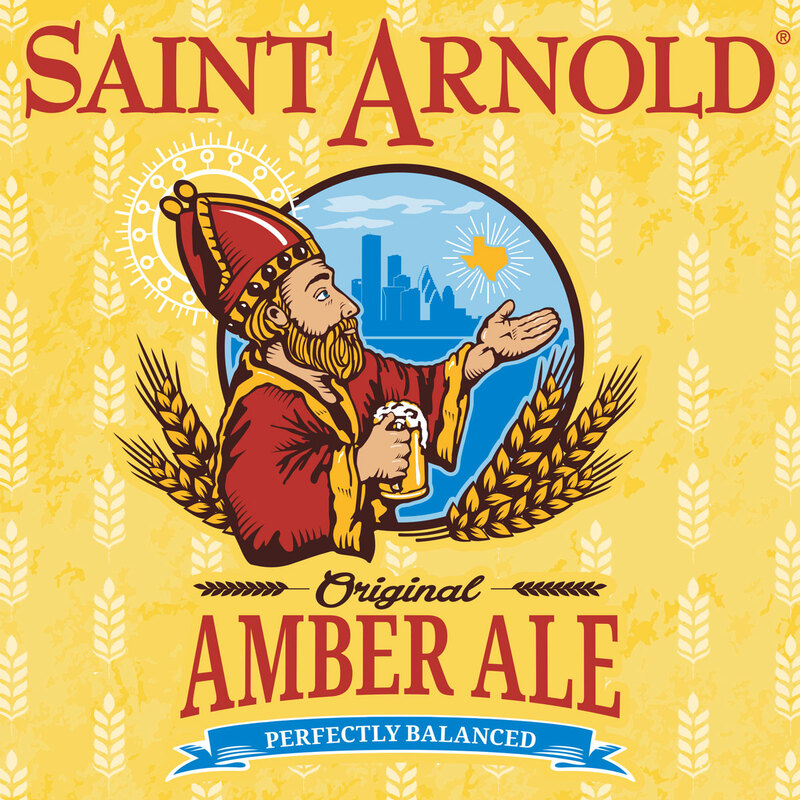 Saint Arnold Amber Ale is our flagship product and our first official brew. When asked how many test batches were brewed in creating the Amber recipe, Brock Wagner quickly replies, "Six." We have heard rumors that we've changed the Amber Ale recipe. While we did tweak the recipe a little bit during the beer's first three months, it hasn't changed since then. Which means we're still brewing the same Amber Ale recipe we brewed at the end of 1994! Saint Arnold Amber is the movie star of the bunch. If you look for it, you can spot the Amber tap handle in the movie Miss Congeniality. (The location is supposed to be a bar in San Francisco but it's actually the Dog and Duck Pub in Austin!) Also, in The Evening Star, you can spot Juliette Lewis' character's boyfriend in a Saint Arnold front-logo t-shirt. Later in the movie you can spot the characters drinking Amber Ale at the Pig Stand. When our first production batch of Amber Ale was released, we discovered that we had inadvertently brewed an IPA. While quite tasty for an IPA, it wasn't what was intended and we noticed all the non-hopheads (the majority of people) at the opening party making funny faces. There were 17 people in Houston who loved it and they complained bitterly when we corrected the recipe. At Saint Arnold, we are passionate about animal rescue. A number of us here are proud to have rescue animals as family members. To this end, we are donating a portion of the sales of Ale Wagger to support local rescue organizations to improve the lives of animals in our communities. A beautiful, deep copper brown ale. It has a full, malty body with hints of chocolate, a touch of sweetness and a light hop flavor. A complex malt character is created by combining five different types of malts. It has a rich, creamy head with a fine lace. The light fruitiness, characteristic of ales, is derived from a proprietary yeast strain. Saint Arnold Ale Wagger Brown is best consumed at 45-50° Fahrenheit. Recommended pairings: Pecan crusted snapper & venison. We use five different types of malted barley in Ale Wagger. No other grains or cereals such as corn or rice are used. The combination of malts creates a balance between malty sweetness, chocolate roastiness, and alcohol. We use three different Pacific Northwest hop varieties in Ale Wagger. The resulting hop character is a very light and pleasant bitterness with a subtle hop flavor and aroma. Debuted June 1995 as the original Brown Ale. Debuted September 2014 as Ale Wagger Brown. Our original Brown Ale was released in celebration of our one-year anniversary. Developing the original Brown Ale recipe proved quite tricky, especially in achieving the nice chocolate character without it becoming overly roasty. Perfection was discovered in using one-half percent of the total grain bill being chocolate malt. This means that out of 2,000 lbs of malt, only 10 lbs are chocolate malt. Using 15 lbs would create a dramatically different flavor. This is one of our favorite beers for pairing with food. The most memorable pairing with this beer was a sauteed pecan crusted red snapper with white wine butter sauce and tiny green beans at a beer dinner we did in 1995. It was unexpected that such a rich, chocolatey beer would pair so well with a light fish dish. The key to the pairing was the nuts which brought out the nutty malt character in the beer. Way back in 1995, we wanted to come up with a fun event that was allowed under the then-current beer laws of Texas. Pre-announced promotions at specific locations were forbidden, but a pub crawl with only hints given as to where the stops would be was legal. It was then that the Saint Arnold Pub Crawl - part pub crawl, part scavenger hunt - was born. Our first one had 25 attendees and included a sit down dinner for the entire crew at the now-defunct Village Brewery in Rice Village. The laws have since changed, but our Pub Crawls have continued. We now host them almost monthly around the Houston area and our other markets. To add to this tradition, we're debuting a beer that's hoppy, balanced and - at 4.7% ABV - perfect for enjoying throughout a Pub Crawl. This crisp, sessionable Pale Ale is brewed with a combination of hops: Centennial hops at the beginning of the boil for bitterness, and Amarillo and Galaxy hops at the end for the bulk of the flavor and aroma. Two Row Pale and Maris Otter English Pale malts give the beer a slight color and tiny amount of sweetness. Golden naked oats malt lend a nutty, more full-bodied flavor, and the London III yeast accentuates the hop flavor and aroma. Citrodos IPA is an American IPA with lower ABV and IBU than typical of the style. It has a glowing golden hue with off-white head that lingers through the glass. The aroma has pronounced citrus and tropical fruit notes. The hop flavor from the Citra and Centennial hops begins with orange and grapefruit character, with a honeydew finish balanced by a graham cracker malt sweetness. Citrodos IPA finishes clean and dry. Made with all British malt. The base malt is Maris Otter, augmented with some medium crystal malt. We use a single hop in this beer: Cascade. This is a distinctive American hop noted for it’s citrusy flavor. We make three hop additions in the kettle as well as a large dry-hopping in the fermenter. Our Elissa IPA is pure, with no additives or preservatives. In order to maintain the freshest flavor possible, we do not pasteurize our beer. Many of its subtle flavors are delicate and would not stand up to the heat of pasteurization. We recommend that this product be stored cold to avoid any degradation in flavor. We had wanted to brew an IPA for several years, but our water was too high in calcium carbonate which tends to impart a harsh bitter to such beers. It was not until we installed our reverse osmosis system that we could do so. Reverse osmosis takes the water coming into the brewery with about 300-500 ppm dissolved solids and strips it down to about 5 ppm. We then can add back only the minerals that we want. This way, we can recreate the brewing water of anyplace in the world. Actually the RO system improved all of our beers. And lets us brew a delicious, hoppy IPA! This beer is named after ELISSA, a tall ship now moored in Galveston. Ships like ELISSA were used in transporting IPAs to India. 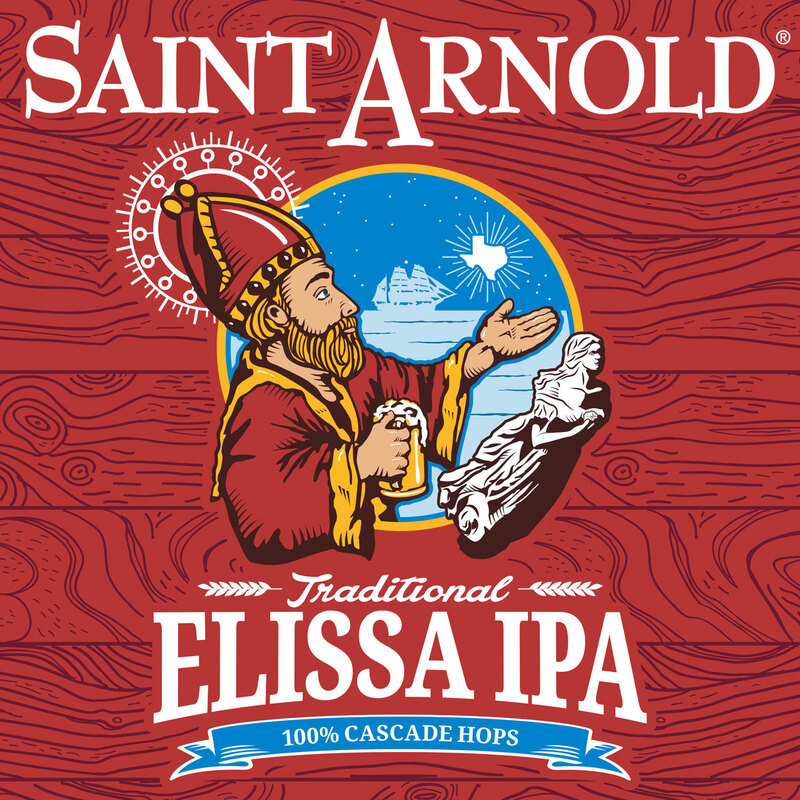 Saint Arnold Brewing Company donates a portion of the proceeds of this beer to the Galveston Historical District for preservation of this ship. IPAs were first brewed in the late 1700s in England for transport to the British colony of India. The high level of hops combined with higher alcohol levels worked as preservatives to keep the beer good over the long voyage to India where conditions were not conducive to brewing. A small portion of Elissa IPA is routinely drained from the fermenters, dry-hopped, cask-conditioned, and delivered to select local pubs and served from old-fashioned beer engines. Read more about cask conditioning on Wikipedia. The nose is a blend of apricot and tropical fruit and mango. The taste starts with a big bitter blood orange that morphs into mangos and sweet tropical fruits. There is a lightly sweet malt body that allows the hops to shine while maintaining a nice complexity to the flavors. Made with 2-Row Pale, Cara 45 and Carafoam malts. The hops used during the boil - Columbus, Cascade and Simcoe - are reminiscent of the West Coast style and provide pine notes. A generous dry hopping of Amarillo, Simcoe and Mosaic brings out the tropical mango and citrus aromatics. The use of a special yeast provides a more fruit forward aroma and flavor than the standard Chico yeast commonly used in IPAs. 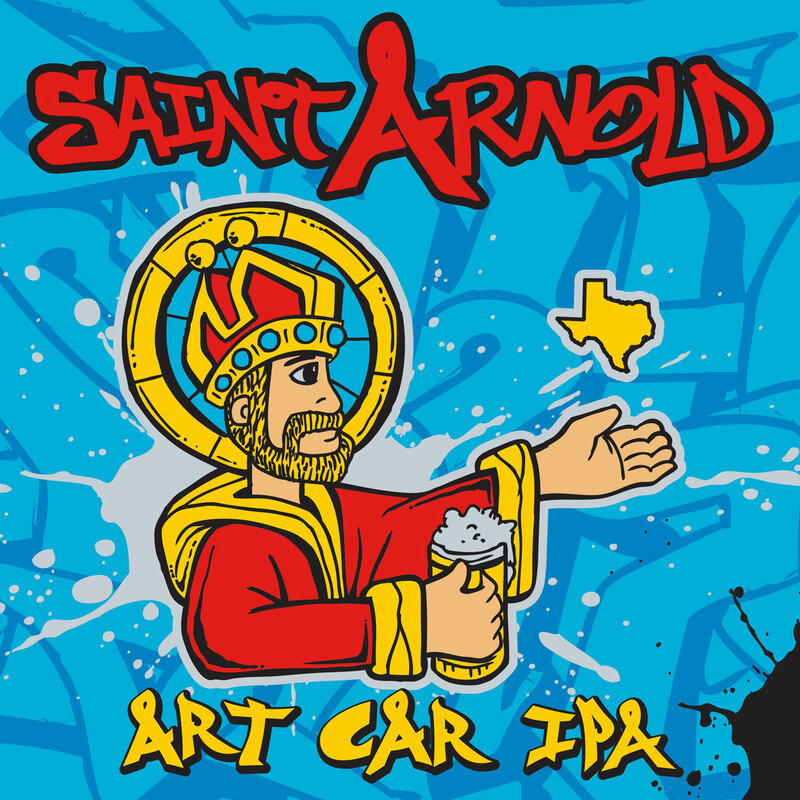 The Art Car IPA name was inspired by the fleet of hand painted Art Cars created by local artists for Saint Arnold. The label artwork was designed by renowned Houston graffiti artist GONZO247, who has painted four Saint Arnold Art Cars. Seven of our brewers competed to have their recipe chosen for this beer. From there, we narrowed it to five recipes from two brewers. We did three brews of the final recipe, each with a different yeast. Our final choice was a new yeast for us. Raspberry AF is a fruited Berliner Weisse. It is a light bodied but surprisingly flavorful sour wheat beer brewed with lots and lots of real raspberry. The flavor is an upfront, thirst quenching raspberry delight, followed by a tart and dry finish, making your palate thirst for more. This beer is brewed with wheat (60%), pilsner and Vienna malts. It is centrifuged but not filtered so expect some amount of haze in the beer. There is a small addition of Hallertau Hersbrucker hops added during the short boil of this beer. 3,000 lb of 100% real raspberry purée is used in each batch. Our Raspberry AF is pure, with no additives or preservatives. In order to maintain the freshest flavor possible, we do not pasteurize our beer. Many of its subtle flavors are delicate and would not stand up to the heat of pasteurization. We recommend that this product be stored cold to avoid any degradation in flavor. Big, sweet, flavorful and old-fashioned! 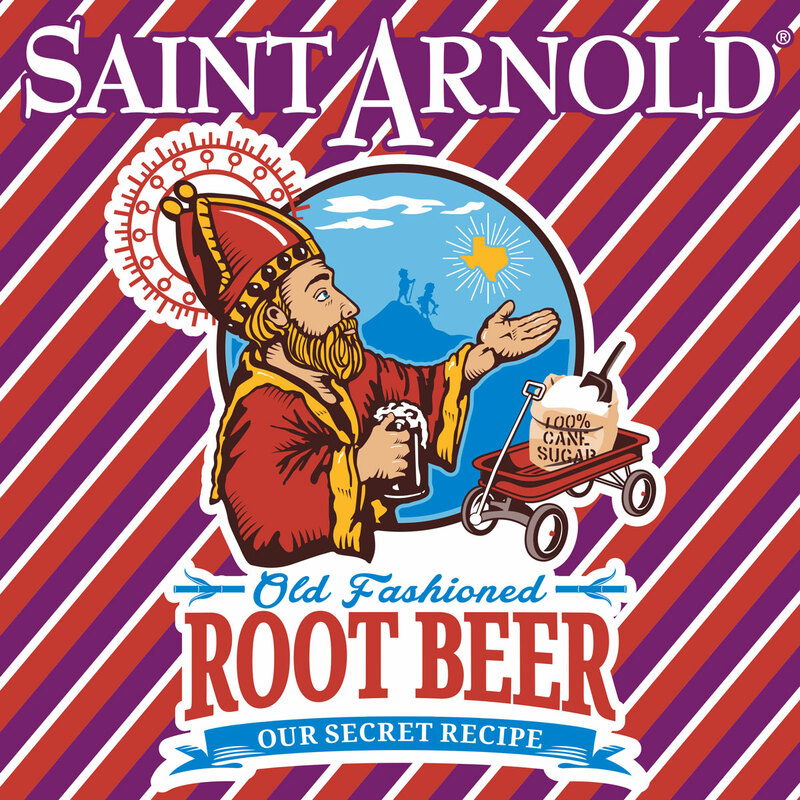 Saint Arnold Root Beer is made with Imperial Cane Sugar (absolutely no high fructose corn syrup), vanilla extract and lots of yummy (but secret) flavorings. The cane sugar gives it a sweetness and mouthfeel that cannot be achieved through corn syrup. The flavors explode in your mouth. The only way to improve on our Root Beer is to add a scoop of vanilla ice cream! We noticed that we had a lot of families attending our tours with their children. As giving the kids beer, while legal in the state of Texas as long as they were with their parents, was frowned upon, we decided we needed an alternative. Root beer seemed like a fun idea. And so the research began. Making root beer is much more of an immediate gratification process compared to beer. You heat up some water to dissolve the sugar, then you cool it down and add the root extracts. Most of the extracts are from real plants, but some, such as sassafrass, have pesky carcinogens in them and thus we opted to replace those with artificial flavors. We developed a good root beer base, but we wanted a great root beer so we started playing around with small amounts of other natural flavors. We finally found one that worked great and went with that. We could tell you what it is, but then we'd have to kill you. If we did tell you, you would immediately recognize it. Nobody has come up with it though without being prompted. We use all cane sugar in our root beer which is stupidly expensive because of government controls on sugar pricing and imports. It creates a great mouthfeel to the root beer though and gives a much fuller sweetness than the thin sweet taste one gets with high fructose corn syrup. We actually make no money on our root beer. We make it for fun and put no effort into selling it. Sales continue to climb on it even without our trying though. Oh well. Strange fact: drinking root beer gives you very refreshing burps. It's the wintergreen. On July 17, 2018, Saint Arnold Weedwacker was packaged for the final time. Weedwacker was born in August 2010 in the Fifth Ward neighborhood of Houston, Texas. He will be remembered as a pioneer in the local beer scene, the first of several beers released in the Saint Arnold Movable Yeast series. In life, Weedwacker was a Hefeweizen... sort of. His drinkers described him as refreshing. Quaffable even. In 2016, Weedwacker moved to cans and later, his merits were recognized nationally, garnering a gold medal and three bronze medals at the Great American Beer Festival. Going out on top, Weedwacker also took home a gold medal at World Beer Cup earlier this year. In lieu of flowers, contributions in memory of Weedwacker may be made to your local grocery or liquor store, where funds will be accepted in exchange for the remaining cans of Weedwacker. Weedwacker is survived by half brother Fancy Lawnmower and cousin Santo. Weedwacker is essentially a Bavarian hefeweizen. Except it isn’t. Weedwacker is exactly the same beer as Fancy Lawnmower Beer but we ferment it with Bavarian hefeweizen yeast instead of kölsch yeast. It is light and refreshing but has a spicy clove note and some banana esters that come from the different yeast. While it is a close relation to Lawnmower, it tastes completely different. Also, Weedwacker is our only unfiltered year-round beer. Expect to see some yeast at the bottom of the bottle. This beer is brewed with just pale malted barley and a dash of malted wheat. We import the world's best pils and wheat malts to create the light yet rich malt body. Several years ago at the oldery, we had some extra Lawnmower wort that wouldn’t fit into a fermenter, and we had some Bavarian Hefeweizen yeast on hand, so we combined them in one of our small yeast bright tanks just for fun. We didn’t release it, but we did drink a lot of it ourselves. That led us to the Moveable Yeast concept and Weedwacker was the first release in this series.